It’s been in effect since December 1st 2017. So… you no longer have to pay up to $90 to unlock your device. Third party companies that used to offer unlocking services to Canadians are going bust by the day. I say, it’s about time (holding my pitchfork)! It’s definitely a win for consumers. The reality is, selling locked devices has been seen as unfair practice around the world. Canada has been slow to implement protections via law. No need to ask Papa Rogers or Bell for permission to use your phone when travelling out of country. Most Canadians have taken part in the pre-vacation ritual of calling their wireless provider for a travel package. If you asked politely you may have a “temporary unlock”. Then you’d come back to a locked device once again. Let’s be real, these packages sucked! A better option is to get a Sim Card with a local wireless provider at your destination or buy a travel sim card before you leave. Now that you’re device is unlocked, you can! No jack, you can’t leave your current provider for another because your phone is carrier locked! Yes jack you did pay for the phone, and if you add up your phone plan vs a BYOD plan (bring your own device) you paid with interest. On the plus side, 2018 Jack can now switch providers on a dime. He can walk away from less than stellar service for a more deserving carrier. With more user flexibility, the CRTC hopes to stimulate competition. The idea is if consumers are nimble to quickly switch for the best deal currently in the market, It, will puts heavy downward pressure on prices as wireless providers jostle for user retention. Unlocked phones are worth more than locked ones. We never really think about it until it’s time to sell your phone. Let’s say your smartphone plan is $95 a month. After two years of the contract, you would have paid $2,280. Now assume you buy an iPhone X at $1,319. After two years the cost of the phone is 36% of the total cost of both your phone and the plan. When you’re ready to sell your phone, getting the most cash back can make all the difference in saving you a ton of money. GizmoGrind users will know that our iPhone trade in prices for devices still locked to a carrier have gone up significantly since we do the unlocking for you. Unlocking your phone can be super simple, some companies make it easier than others. With the tips I’ll lay out, I’ll show you how to quickly unlock your device with the major hitters the fastest way and avoiding pitfalls that may give your provider reason to keep you stuck with a locked device. Who Is Eligible for Free Unlocking? That’s a separate topic altogether. This unlock guide is for unlocking a carrier lock which prevents you from using your device with a Sim Card other than the carrier it was originally purchased from. There may be some reasons that prevent you from being able to unlock your phone for example if it’s registered under a corporate account. Or if the device has an account on it that is still active with an outstanding balance. 90% of devices should have no issue being unlocked. First head on over to this Rogers page to get a live chat going here. 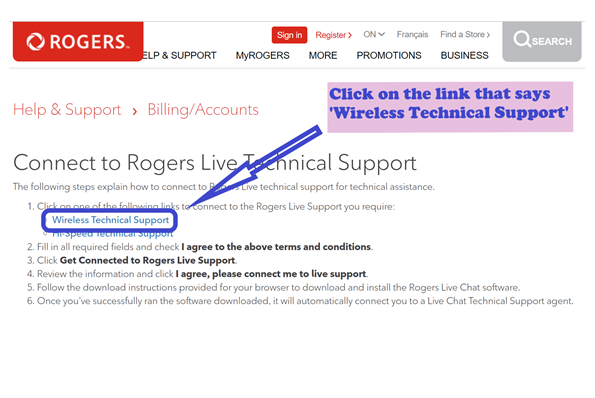 Then, click the link for Wireless Technical Support which will take you to the general live chat window. 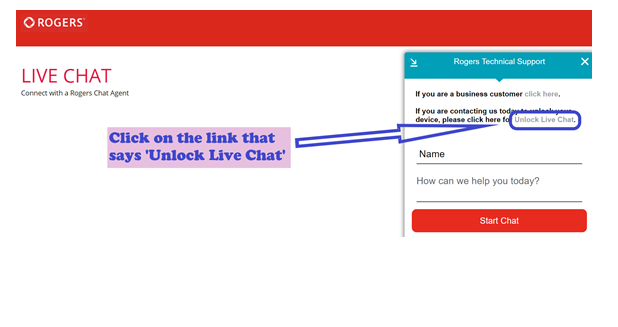 Then, click the link specifically available for unlocking ‘Unlock Live Chat’. Enter your name, and reason for joining the live chat which is to unlock your device, of course! The agent will actually read this description in my experience which is super helpful! Once you’ve filled out those details, click the red Start Chat button. Wait for an agent to join the chat, which is usually very quick but can take a few minutes if they’re particularly busy. The wait time is much shorter than calling in on the phone. They will ask for your IMEI number which is unique to your particular device and can be found by dialing *#06# right into the keypad. If they ask if you have an active account, say NO to make things simple since you don’t need one to have your phone unlocked! Then, they will take a moment to enter the IMEI number into their database to clear it for unlocking which is usually instant. They will unlock up to 5 devices at a time per chat. Once they’ve completed the unlocking process (which is instant) simply insert a NON Rogers SIM card and give it a moment and you will have an unlocked device which can work with ANY SIM card you like. For iPhone, you may need to restart your phone to let the update kick in. If you’re unlocking an Android, they will provide an unlock code which can be entered into the appropriate field which will appear when you insert the non Rogers SIM card. Unlocking a Bell device over the phone is difficult! With the calling in method you’ll have to go through all the number menus and will probably still end up with an agent from the wrong department. They’ll transfer you sometimes more than once just to get you to the right person who could help you unlock your phone. Here is a way via Live chat that’s easier. Start by heading over here to their Bell Mobility Technical Support page. 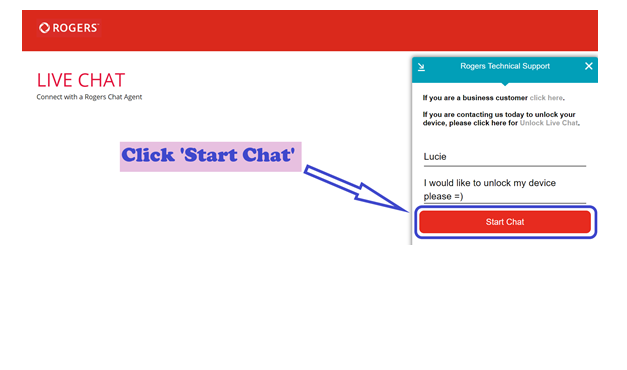 Once you reach this page, it’ll take a few seconds for the chat live button to appear but when it does, click it. Then, you’ll be given a few options to choose from and you want to choose ‘I want to upgrade my device’. When the agent appears online which is usually almost instant, let them know you’d like to unlock your phone and provide them with your IMEI#. Again, if they ask if you have an account with Bell say No just to simplify. They will unlock up to two devices per chat. 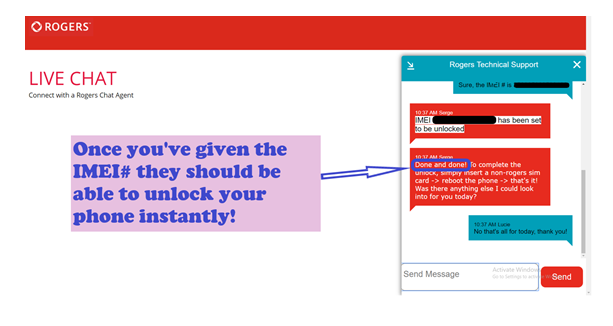 If your device is eligible for unlocking, they will request your email address to follow up letting you know that they’ve successfully had your device unlocked. You will want to give them a valid email address here. You can do this as many times as you’d like, but are limited to unlocking two devices per chat. Response time is about 4 hours max, but often you will find that it’s much less. Insert a Non-Bell SIM card and your phone should be unlocked! They will email you the unlock code for Androids which you’ll be prompted for when you put in the Non-Bell SIM card. This is fairly common and probably the most frustrating issue. If none of these solutions work for you, then our best guess is you probably have a replacement device that you received after breaking your phone. For some reason, we think it’s possible Bell doesn’t seem to keep track of these imeis. To put it bluntly your stuck with a locked phone. But first, try these solutions. Check to make sure your device is not already unlocked. Put in a Non-Bell sim card and if you don’t get a activation screen or request for a code, then your phone should be unlocked. Check to see if your device is on the MTS Network. We also found that not all MTS Phones are registered in the bell system. Try calling MTS directly, it may be on their system. Insert a working Bell SIM card and while its inserted and getting bars, check for software updates, and then restart your device. Then try calling Bell to see if it shows up. Active Account on the device. Bell is the only carrier we know of so far that is actually enforcing a stipulation that your device not have an active account on it before they unlock it. If you consider every device sold in 2018 is unlocked, active account or not, why would Bell have any issue unlocking devices bought during the dark ages of phone locking. You guessed it. It’s an obvious attempt to keep customers tied down. In fact, it’s quite possibly illegal at this point! The solution is to either close off any remaining contract balance on the device or wait it out. Telus, like Rogers has a no hassel policy with unlocking your phone. It’s quite simple to to do through their live chat platform, however they require your phone number to call you in order to complete the process. I’ve found that their live chat wait time depend on how busy they are but is usually fairly quick and having them call you through the live chat is much quicker and simpler than you calling them. 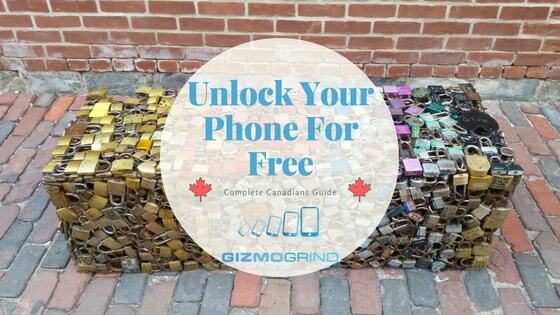 This will work to unlock Koodo devices as well. To begin, head over here. On the landing page, you’ll have two options to click on to get to an agent; either the Live Chat box, or the floating live chat icon. Choose either since they’ll take you to the same place. Then, be sure to choose Mobility, and then in the drop down menu you’ll want to select Technical Support. Also enter your name, and phone number because they will need to call you. They will require your phone number, some agent will call you within seconds to confirm that they’ve unlocked your phone. To simplify, mention your imei number in the chat like this IMEI# 359**********. That way you don’t need to read it out on the phone. Provide your phone number and it will ring almost immediately. They’ll indicate that they are processing your request which, once they do, your device will be instantly unlocked! You can unlock up to 7 devices at a time this way. True to their name, Freedom Mobile is not out to sentence you to two years with a locked device. They are definitely up there with Rogers and Telus when it comes to ease and speed of unlocking your device for both iOS and Android phones. If you have an account, use the unlock Tool by clicking here and signing in. Otherwise, our recommended method to unlock Wind Mobile Phones is by simply calling. No account needed! Call 1-877-946-3184 once connected give it a few seconds and press * on your keypad. Provide the representative with your IMEI number. You can find it by dialing *#06# on both your iPhone or Android. It’s also available in the about section of your settings. You’ll get an unlock code if it’s an Android and a confirmation that its unlocked for iPhones, in both cases scroll to the bottom of this page for instructions on completing the unlock. For the most part, Videotron isn’t a problem to unlock. But, they also seem to have the “we can’t find your phone on our system” issue that Bell has. Review the Bell troubleshooting section on solutions for this issue. They do have an unlocking tool, however, the straightforward way is to call in. Call Videotron at 1-877-512-0911, Provide your imei and voila. For iPhone users, you’ll have to wait up to 24 hours but in our testing, it took between 1 and 2 hours to complete. Android users will get an unlock code. iPhone users get an unlock confirmation, scroll to the bottom for our instructions on completing the unlock. The best way to Unlocking an eastlink iPhone or Android is via their live chat. Click here to visit the eastlink support page. You should easily get an unlock code no problem. Scroll to the bottom of this page for instructions on completing your unlock. SaskTel has been awesome with no issues so far, fingers crossed! Being a crown-owned company, like many other government-run organizations in Saskatchewan the service is sometimes better than what you get with many other providers. 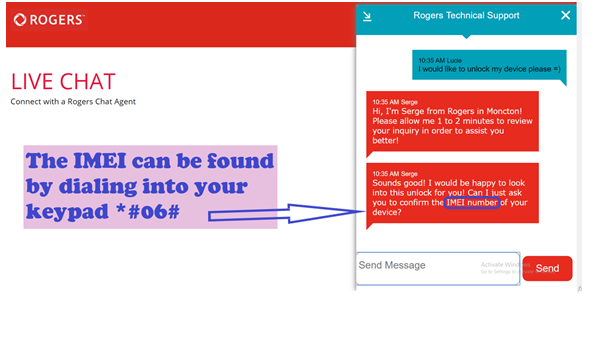 We recommend unlocking a SaskTel Phone through their live chat. Here’s how. When the rep asks if you have an Account Always Say “No”. Regardless the provider, to unlock an Android device you need an unlock code from the provider it was locked to. Follow the instructions for your provider above to get one for free. Then follow the steps below to input your unlock code. Step 2: You’ll see a prompt asking for an unlock code. Be very careful and make sure you add it correctly. With some devices, getting it wrong too many times may result in a bricked phone. Take your time and type it in one digit at a time. Be especially careful with Blackberries. If you get it right, you should see “Network Unlock Successful” and that’s it. IOS devices are unlocked from the cloud. So the time it takes for it to be processed varies depending on the procedures used with your carrier. Bell and its offspring companies will take the longest since they forward their requests directly to Apple. This requires a ticket to be put in and your unlock request waits in line to be processed manually by Apple. Most other Carriers are almost instantaneous since they process the unlock from their own servers. The short of it is once you contact your provider for an unlock, you may have to wait to complete the unlock with the steps below. Step 1: Connect to WiFi. Step2: Insert a sim card from a different carrier, one which the device will not accept. In most cases it will launch the activation screen and quickly go back to your home screen, this means your phone is unlocked and your done! If you get a message saying “Update Complete” select accept and it should then complete the unlock within 30 seconds by jumping back to the home screen. Step1: Insert a SIM card from a different carrier and connect the device to your computer using a lightning cable. Step 2: Once your computer picks up your device, iTunes will do the rest. An odd message. But thank you Apple! That’s it for us folks, let us know if you run into problems in the comments sections and we’ll work on a solution!